This letter was written by 16 year-old Pvt. 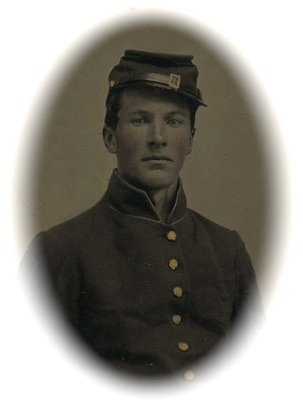 Edward B. Fisher (1845-1926) of Company G, 147th Pennsylvania Infantry who served from September 1862 to June 1865. Companies F, G, and H were organized, sworn in, and drilled at Harrisburg during the months of September, October, and November, 1862. It was while in camp near Harrisburg that Pvt. Fisher penned this letter. Edward was the son of Peter Fisher and Susan Lloyd of Selinsgrove, Snyder County, Pennsylvania. Peter died in 1856 and Susan died in 1861, leaving Edward and a younger brother and two sisters as orphans. The 1860 census enumerates Jonathan Fisher (b. 1821) in the household who may have been an uncle of Edwards and the guardian to whom he addressed this letter. After the war, Edward (born December 1845) married Eliza Jane Williams (1848-1924), the daughter of Elijah Williams of Luzerne County, Pennsylvania. In 1870, Edward resided in Luzerne County and his occupation was given as “laborer.” In 1880, Edward lived in Selinsgrove and earned income as a janitor of the Trinity Lutheran Church. In 1900, Edward operated a boarding house in Penn, Snyder County, PA. He died in the Veteran’s Hospital in Philadelphia. 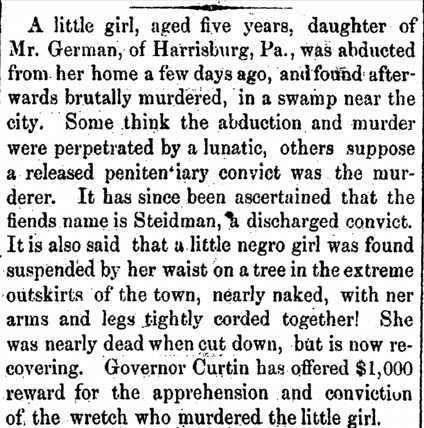 The 5 year-old girl whose murder is described in this letter was Mary Elizabeth German, the daughter of Emanuel Seltzer German (1822-1912) — the proprietor of a religious bookstore at 129 Chestnut Street in Harrisburg. Mary’s mangled body was found in Wetzel’s swamp (now Wildwood Park) near Harrisburg with a pistol wound through the throat. Papers reported on 7 October 1862 that the murderer was known, but not yet arrested. It was conjectured that the murderer mistook the little girl for the daughter of Gov. 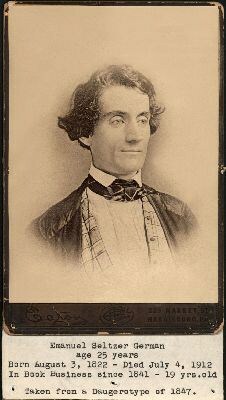 Andrew G. Curtin who had received threats warning him of danger to his family. Curtin offered a $1,000 reward for he arrest and conviction of the murderer following the tragedy. I now take my pen in hand to inform you that I am getting along fine so far — only these crackers we have here are so hard that I can hardly get ’em fine enough to swallow them without almost choking at them. We have bread twice a day and in the evening we have crackers & coffee. There has a great many accidents happened here last week. One car run over a soldier and cut his legs off and broke his shoulder bone. One of the soldiers was down town and picked up a little girl and took to a swamp and shot her through the neck and then cut her throat. The girl was only 5 years old and now no one dare go out of camp. I am going to send my $20 check with this letter and I thought I would like to get myself a pair of boots if you did not care. Our boys are all getting them. They are made for army use. They are worth $8. If you could send me $6, I would have enough. I have $3½ yet of that money you sent me. I think if I run the risk of my life, I might as well get the 3 worth of it. Sometimes I buy my meals. The most of the boys buy theirs all the time. We got a pair of shoes but they will hardly do for wet weather and if you think proper, I wish you would send me 6 or $8, and if you think not, then it is all right and I would like to have some stamps. It may be you think I ask for a great many things but please overlook all. If you think I ought to have them, send them the next chance you get if you please.